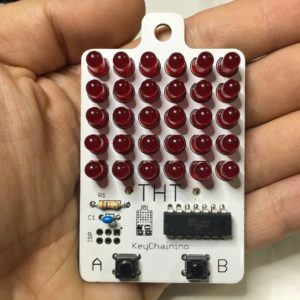 KeyChainino is the first KeyChain game programmable with Arduino! Hi, I’m Alessandro Matera the creator of KeyChainino. to use when you’re on the subway, on the bus, or simply when you are bored and you don’t know how to spend your time, KeyChainino is for you! A few months ago I was waiting for the bus and I realized that I was playing with my keys. So I had the idea to make something to play with in boring moments. Something simple. Just for relaxing. A tiny device to play with, but a non-standard device. A device made with Arduino where anyone can make his own game. Without LCDs, just with LEDs! With this idea, I’ve worked to a tiny device powered by the Atmel Attiny84 that controls a 6×5 Matrix LEDs. The Attiny84 doesn’t have so many pins to drive all the 30 LEDs, so I’ve used Charlieplaxing to drive it. But don’t worry about it! I’ve created a simple function to drive the LEDs just like a simple and common LED matrix! In this way I’ve have created my first game: a simple Arkanoid-like, where a ball just bouncing on the screen and you need to move the paddle – with the two buttons – to prevents the ball from falling from the playing field. Do you want to create your own game? 2. Check-out the Arduino Sketch of my game here and try to edit to make your personal, original, vintage and cool game with KeyChainino! 3. Follow this guide to upload the sketch. 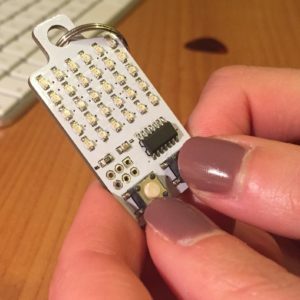 See what Adafruit, Atmel, Geeky Gadgets and others say about KeyChainino! P.S. If your game is really cool, send to me and I will publish it with your credits! I have had a problem making a simple sketch to KeyChainino. The problem was that if I put the code below on the basic sketch to just blinking one LED of the matrix, the LED only turns OFF and never goes ON.